Amongst the mass of Vietnamese haunts along the Pho mile, these 2 sister restaurants are amongst the best of them. Run by the same operator (Vietnamese Kitchen), the once identical menus have slowly bifurcated through the years – Cay-tre staying true to its street food origins while Viet Grill leaning a little towards more up-market food. 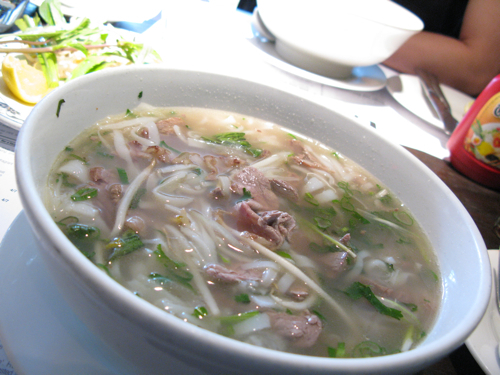 But expect to find some of the most authentic Vietnamese cuisine in London, and good ‘ol staples such as Summer Rolls, Quail curry and the infamous beef noodles (Pho) at both. Who needs fried chicken when you can have Cay-tre’s Wicked Crispy Frog. 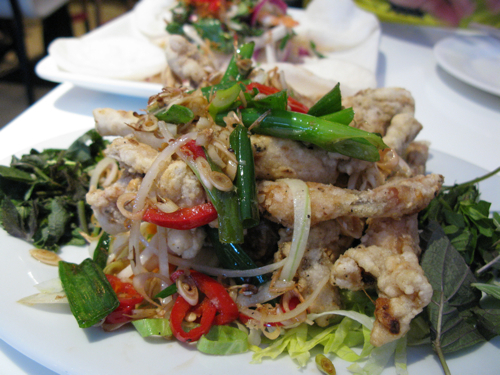 Juicy, delectable frog’s legs, deep-fried in salt, pepper, chilli and lemongrass. Garnished with spring onion, shredded lettuce, fresh mint and chillies, there’s no better way to get the salivary glands going. For those of you who have never had frog before and are are a little put off by the idea of eating something that goes “rebbit”, i promise you, it tastes just like chicken, only sweeter and juicier. 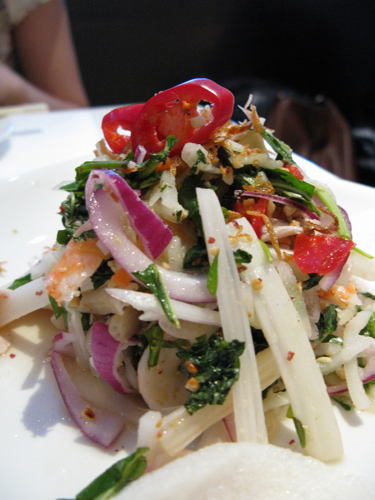 Another one of my favourites at Cay-tre is the Lotus Stem Salad. Crunchy fresh lotus stem, shredded pork and shrimp with sweet red onion, peanuts, herbs and a kick of sweet chili sauce. Tangy, fresh, with bold, punchy flavours, its another starter that is sure to get your mouth watering. 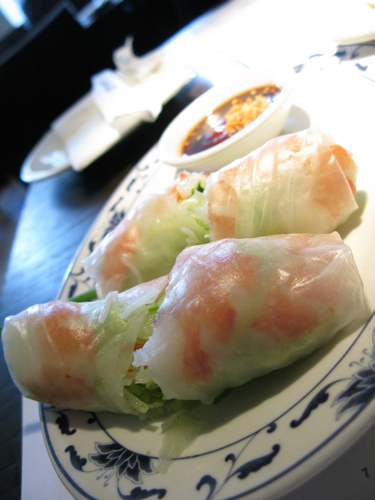 Despite lacking Frog’s legs or Lotus Stem, you will still be completely spoilt for choice at Viet Grill given the more than twenty starters on offer here which including staples like shrimp-stuffed summer rolls or Rice-paper wrapped beef sirloin. For me, the real star here though has to be the Feudal Roast Beef. 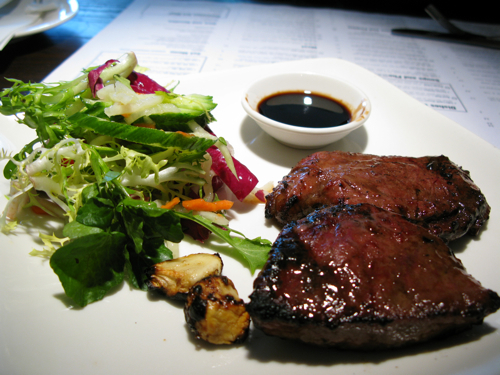 Marinated in a sweet soy sauce and a hint of lemongrass, this Saigon delicacy is seared to medium-rare perfection, and served with 2 plump cloves of char-grilled garlic and a simple green salad. An absolute must. Now, onto the very serious matter of which of the two does a better Pho. Having sampled both on numerous occasions, I think Cay-tre narrowly tips it’s sister to pole position here. Though there is absolutely nothing wrong with Viet Grill’s version, there’s something about the beef broth at Cay-tre which gives it completeness and depth of flavour like no other. It is the original of the two restaurants after all. Despite losing in the Pho stakes, I’m still partial to Viet Grill’s wider menu selection and more spacious, chique ambience. But if its Pho that you are after, I think you will find Cay-tre’s slightly cramped interior and longer prime-time queues a small price to pay for a beef broth from the heavens. omg they have frog in egland! i MUST go! Jade: they do indeed. Come to think of it, you are right – frog’s legs aren’t the easiest thing to hunt down in the uk – hv rarely seen it, even in Chinese restaurants where most things are served. I stil have yet to find a good Vietnamese place in London, but that’s possibly because I don’t venture out of Central/North London very often… This place looks good though, especially the wicked crispy frog! Wicked indeed. p.s My friends went to this karaoke place near the Strand which served frog legs fried in a salted yolk batter! Suyin: Karaoke place with frogs legs ? where is this place? can only think of one at the bottom of Chancery lane (think its called 113 or something). Let me know. Would make an interesting post-work do as i work round the corner.